• 14% idle time—a reduction of almost 10%. • Average fuel burn rate of 2.55 gallons per hour—a savings of .4 gallons/hour/loader. Entire fleet of 500 loaders x (10% reduction in idle time) = about $3.5 million. These enviable results were achieved by Copart Director of Equipment, Safety and Environmental Compliance, Joe O’Leary. Copart is an auto remarketer. They process and sell salvaged and title-clean vehicles from 155 auto yards in nine countries. Their 500-unit fleet is primarily wheel loaders with parallel lift for placing cars onto carriers. At the start, the data didn’t measure up. Joe O’Leary is a long-time believer in the power of telematics data. Unfortunately, until a few years ago, he wasn’t able to use it the way he wanted. That’s because the parameters of the monitoring system on COPART’s loaders didn’t recognize a machine moving at less than three miles per hour as “working.” Wheel loaders in a salvage yard often move that slowly to avoid damaging cars while carrying or loading them. New equipment yields accurate data. 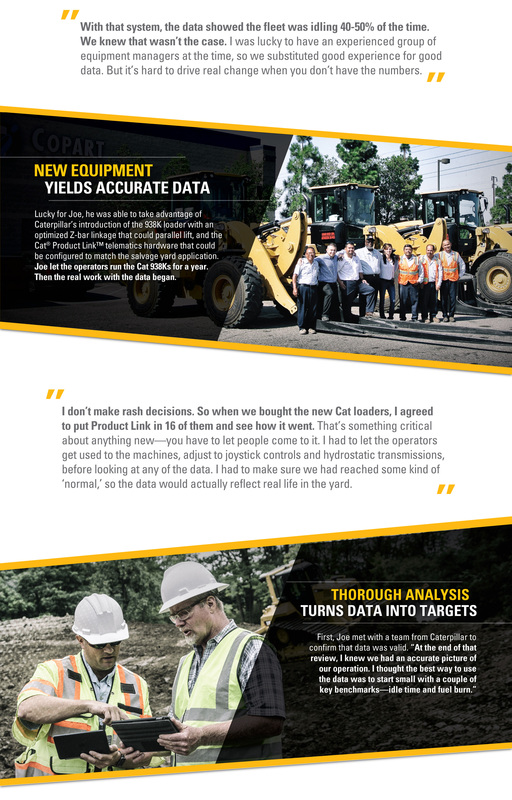 Lucky for Joe, he was able to take advantage of Caterpillar’s introduction of the 938K loader with an optimized Z-bar linkage that could parallel lift, and the Cat® Product Link™ telematics hardware that could be configured to match the salvage yard application. Joe let the operators run the Cat 938Ks for a year. Then the real work with the data began. Thorough analysis turns data into targets. Data-based training helps operators achieve targets, boost profits. • Wrote a set of Best Operating Practices designed to reduce idle time and conserve fuel. • Trained the operators on these techniques for about a month. • Showed them the numbers – where they had been and what their targets were. • Reviewed the numbers with them weekly and charted progress. Data will drive continuous positive change. Currently, Copart is adding more Cat loaders to their fleet. 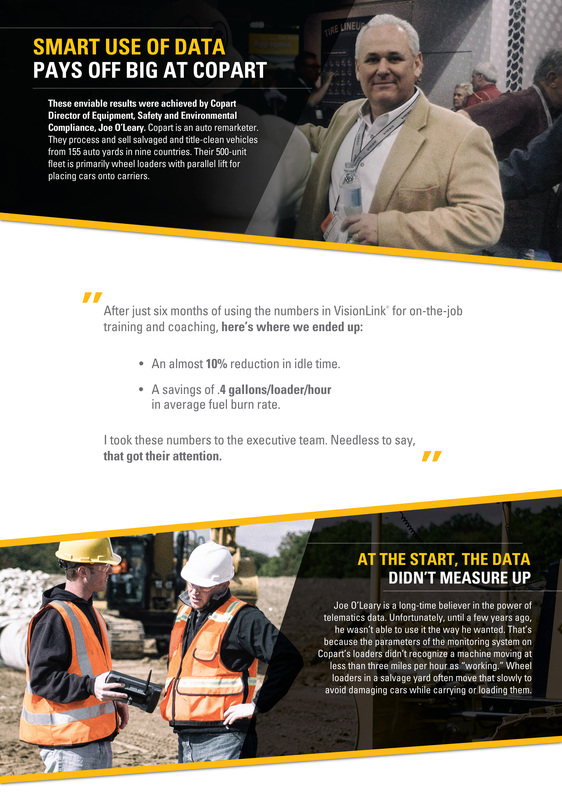 They are managing the VisionLink® data from all of their yards under one account. This lets them compile the data and make decisions quickly. Joe’s plan is to select more key metrics and work with the crews to make positive changes. o You can’t overwhelm people. Give them a manageable number of things. o Use data to engage people, so they can see the impact they have. o Don’t just tell them how to meet the goal, teach them.